POLA and POLB Marine Terminal Gates Closed on Thursday, August 4, 2016 at 5 p.m.
PierPass Inc. has been notified that the International Longshore and Warehouse Union (ILWU) will observe a special stop work meeting for union business on Thursday, August 4, 2016, starting at 5 p.m. As a result, no marine terminal gates at the Port of Los Angeles and the Port of Long Beach will operate between the hours of 5:00 p.m. on August 4 through 3:00 a.m. on August 5. There will be no OffPeak shift Thursday night August 4. Please be informed that West Basin Container Terminal (WBCT) at the Port of Los Angeles will stop operating Saturday OffPeak gates as of July 25, 2015. 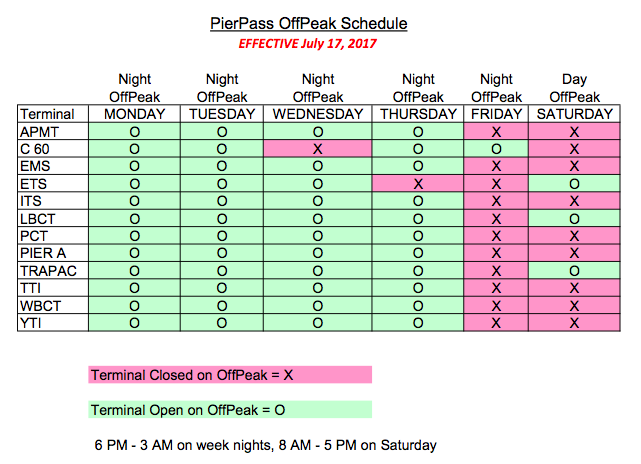 Current gate schedules for all container terminals at the Ports of Los Angeles and Long Beach are available at https://www.pierpass.org/offpeak-information/. YTI terminal in the Port of Los Angeles will stop operating Saturday OffPeak gates starting Saturday, March 7, 2015. Gate schedules for all terminals are available at https://www.pierpass.org/offpeak-information/. Please note that the gate schedules change effective Feb. 26 and again effective March 6. GGS terminal in the Port of Los Angeles will stop operating Saturday OffPeak gates as of Saturday, Feb. 28, 2015. 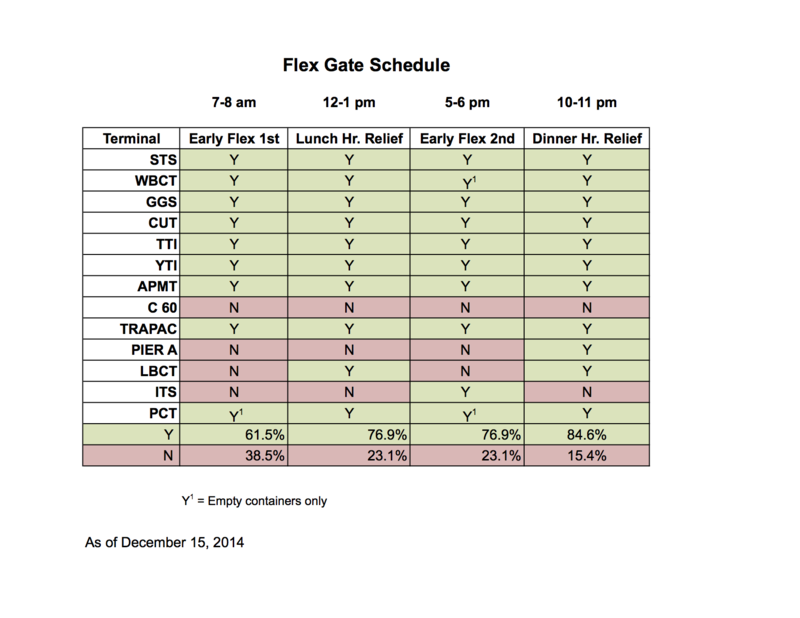 A new gate schedule for all terminals, effective Feb. 26, 2015, has been published and is available at https://www.pierpass.org/wp-content/uploads/2015/02/RollingSchedule.2.26.15.pdf. PierPass has been notified by several terminal operators of chassis shortages. We strongly encourage your drivers to please bring in an export, empty or bare chassis when picking up an import. Please have your drivers ensure that chassis are in good order to prevent delays and/or issues with out-gating. For additional information please contact the respective chassis pool provider.